★ Shizan Individual for 2 dan & below has been changed to exactly Toyama Ryu No. 5 as of 20 July 2015.
in front of JR Tsurumi station East exit. Get off at “Morinaga-kojo mae” and 7 minutes’ walk. Accommodation: Suggested reasonable hotel in Tsurumi area as below. Detail of the Taikai events will be decided later. The tournament system is described below. No divisions. To perform designated forms as described below. Kumitachi. No sword contact to any part of the body is allowed. Tameshigiri: Indivisual performance classified by divisions as described below. Subject to approval of the committee and consent of parent for under 18 years old. Note that each division has different requisition of performance. Proper posture, foot work, Kiai and manner are common standards for all divisions. An incomplete cut, missed cutting attempt, knocking the stand over or the target off will result points off. Cut below the red rubber mark at 15 cm from the bottom of the target will result points off. Team cutting: Three contestants per team, No divisions. To perform 6 predetermined cuts as described below. Cumulated points of 3 judges for preliminary rounds and cumulated points of 5 judges for the final round. Final round will be held if more than two courts are used for a division. 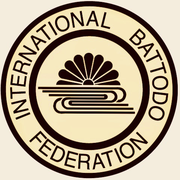 The first (and may be second too depending on number of contestants) from each court are qualified for the final rounds. In case the score points are equal, the closer one between highest and lowest among the judges wins. In case it is equal too, then a rematch is to be held. Start from single-handed Jodan Kamae, three steps forwad with the right leg first and then three Kesagiri with flow of Toyamaryu No. 5. 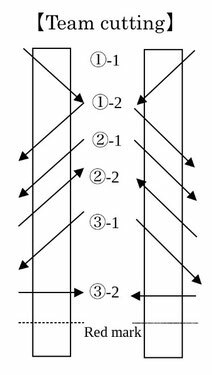 Cutting angle shall be around 40 degree with equal interspace on each cutting. ※ Take a firm pause between cuttings. ※ Footwork: For changing steps to cut the opposite side of Makiwara, firstly bring the rear foot to a side of the front foot, then withdraw the front foot a single step backward. Start from either Nukitsuke or Chudan-kamae, one or two steps forward to cut left Kesagiri, right Gyakugesa, then change steps for left Gyakugesa, change steps for right Suiheigiri with smooth flow though firm stopping of the sword required between cuttings. Any Nakamuraryu Noto. ※ Cutting shall be with smooth flow of movement, yet pause firmly for a moment between cuttings. Do not drift the sword. Start from Seitei Toho No. 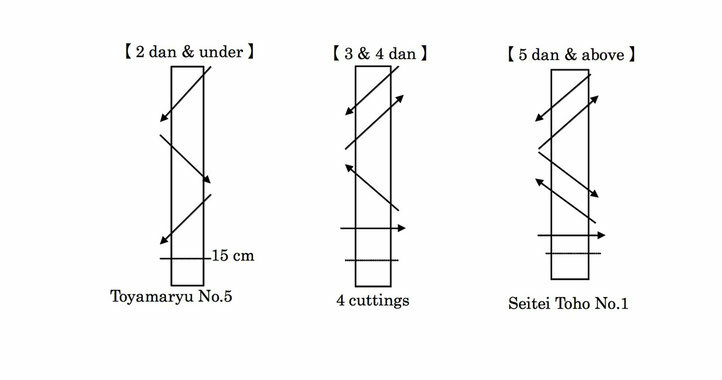 1, i.e., three steps forward with the right leg first for Nukitsuke (single-handed horizontal air cut), then move the left leg forward and the right leg forward to cut left Kesagiri & right Gyakugesa, change steps for next opposite side cuttings of right Kesagiri & left Gyakugesa, and change steps for right Mayokogiri (true horizontal cut). One step back for Zanshin (e.g., Chudan Kamae, Chiburi ) & Noto. Smooth flow of body movement like Kata performance is a key point though firm pause of the sword is required between cuttings. ※ Cutting shall be with smooth flow of movement, yet pause a moment between cuttings. Do not drift the sword. ★ A team consists of 3 contestants. becomes a score of the team.